I've started reading Hal Jordan and the Green Lantern Corps just as it seems writer Robert Venditti is bringing his Green Lantern franchise run to a close. Eighty-five issues is certainly respectable, but it's bittersweet because Venditti's Green Lantern work has been continually of high quality and continually improved on itself. With the Rebirth Hal Jordan and the Green Lantern Corps Vol. 1: Sinestro's Law, Venditti crafts well a tale that finds its origins in the previous DC You Green Lantern era, but also offers a perfectly accessible jumping-on point. Whereas Venditti's inaugural story in the franchise was heavy on the multi-hued Corps mythology set up by previous writer Geoff Johns, Sinestro's Law is a more straightforward superhero sci-fi epic -- perhaps the most basic and least encumbered Green Lantern story I've read in a while, though surely not without nuance and strong characterization. Additionally, here at the beginning of the Rebirth era, Venditti brings Hal Jordan's own arc full circle in a way that I thought most appropriate for the character. The modern era for Hal Jordan, we know, began with the former hero going mad and decimating the Corps, to be replaced by lone Green Lantern Kyle Rayner. 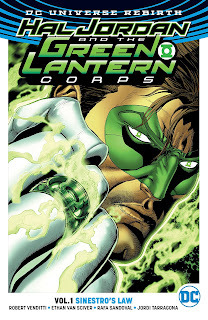 Eventually Hal returned, though in many Lanterns' bad graces, and the trajectory of Johns' run was for Hal to build himself back up until, at the start of Venditti's, Hal became Corps leader. That's an arc enough, but I was struck by Hal's (albeit mistaken) belief toward the end of this book that he himself was now the last Green Lantern, all that stood between the universe and Sinestro's total conquest. Given that it was Sinestro after all who sent Hal down his original dark path, it seemed fortuitous and fitting that Hal, once the lone, "worst" Lantern facing off against Sinestro, was now the last, best Green Lantern facing off against Sinestro. Though of course Hal's name is in the title, Sinestro's Law purports to show Hal's sacrifice and death -- it's a good starting place when what could have been this book's inspirational finale instead only serves as its beginning. This is among the first times Venditti has had characters like Guy and John all to himself, with their most recently having been written in Green Lantern Corps by Venditti's frequent co-writer Van Jensen, and Venditti does well with them. Venditti's Guy shines; essentially tortured for the entire book, Venditti's Guy is tough and funny and represents the best of the character, with plenty references too to Peter Tomasi's most recent new origin for Guy. Venditt's John is, among other things, blessedly angst-free, and it's good to see John having attained the status of Corps leader (John is probably a better fit for the job than Hal, but I hope Venditti can find some way to give them both the honor without any hard feelings that, too, should be beneath the characters at this point). Venditti engages in a mild bit of retroactive continuity here, reframing the end of Cullen Bunn's Sinestro series such that Sinestro's apparent infirmity and abdicating his role as Sinestro Corps leader to daughter Soranik Natu becomes now just a ploy for Soranik to help shore up Sinestro's despotic hold on the universe. I don't quite think this is what Bunn meant -- unless Bunn's Sinestro is a really good actor -- nor am I even sure that Venditti's own Green Lantern: Rebirth special included here holds this up, but obviously a good villain wasn't going to stay down for long. And Venditti handles Sinestro well, too; even as Sinestro makes plans to rule all of creation, he's still brought short by sedition within his own ranks, and his unique code of honor sees him freeing a child errantly kidnapped by his minions. I appreciated also that Venditti's story is relatively mythos-free. Obviously Hal and Sinestro both pick up from their various DC You iterations, but in terms of backstory Sinestro's Law is a far cry from the history of Relic and the "lightsmiths" in Venditti's inaugural Green Lantern Vol. 4: Dark Days or the complications of books like Johns' Blackest Night. Though again with strong character showings all around, this is basically just a Hal Jordan versus Sinestro tale, and I found the simplicity refreshing (I'm sure the other-hued Lanterns are just around the corner). Again, Rafa Sandoval offers a simplicity of lines (a bit like Barry Kitson in Soranik's hair) that underscores the fine forthrightness of the story. It is a shame that Robert Venditti is leaving the Green Lantern franchise among other reasons, as I've said before, because of how effortlessly he came in and filled Geoff Johns' very large shoes on the titles. As the beginning of the end, however, Hal Jordan and the Green Lantern Corps Vol. 1: Sinestro's Law is a lovely story of two arch-nemeses at it again, and this book probably deserves a certain amount of recognition as a "new classic" encapsulation of the Green Lantern/Sinestro rivalry.